- Some 360 attendees enjoyed the Industry & Training Awards gala dinner at Optus Stadium on Friday, March 8. CCF WA CEO Andy Graham said the night was only made possible because of the support of the companies that provided nominees for the corporate and individual awards. There were 12 Industry & Training Awards presented, with four corporate awards for excellent achievement in safety, training and Aboriginal engagement, and eight awards for high-achieving people in various fields. TRS sponsored the Project Manager of the Year Award. 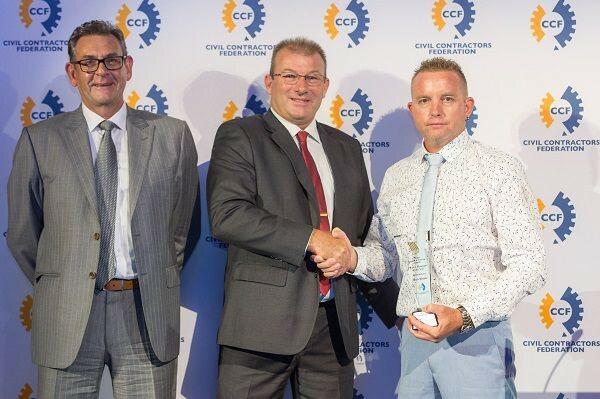 Mark Godsell (TRS) congratulates Ben Shaw (Valmec) for winning the Project Manager of the Year Award.